Following ASAS’ recent decision on Pink Dot’s Cathay Cineleisure ad, both Cathay and Pink Dot have given Marketing their response to the authority’s decision. Cathay confirmed that ASAS had followed up with the organisation, but maintained that it was the owner of the advertising platform provided to Pink Dot. “Given that the ownership of the ad belongs to Pink Dot, Cathay is not in the position to decide on the removal of the statement ‘Supporting the freedom to love’ on the advertisement,” a Cathay spokesperson said. The organisation however, stated that it would relay ASAS comments to the organisers of Pink Dot. Meanwhile, it added that it stands by its previous statement to support an all-inclusive society. “Since making the statement, Cathay has received, and is grateful for the tremendous outpouring of positive support from the public through emails and social media. We hope that this positivity can be felt by all, and wish for greater acceptance and understanding amongst fellow Singaporeans,” the Cathay spokesperson said. When asked by Marketing what Pink Dot intends to do following ASAS’ decision, a spokesperson said that its tagline “Supporting the Freedom to Love”, has never detracted from its message of inclusion and diversity, of embracing and welcoming everyone regardless of their race, language, religion, sexual orientation or gender identity. We cannot see how a tagline calling for inclusion and love can be seen as undermining the concept of family, or disrespecting the individual. We cannot help but wonder if the council’s request arose out of complaints by a small group of people against Pink Dot who vociferously support the discrimination of Singapore’s LGBT community. The spokesperson said that Pink Dot is confident that Singaporeans will able to discern its message of inclusion, diversity and love from one that seeks to divide them because of differences. “Our aim is to have conversations and dialogue to promote understanding; through this, we hope to achieve consensus and not conflict. As such, we are open to speaking to ASAS and invite them to a frank discussion on this,” the spokesperson concluded. Following the saga, netizens were also quick to notice the installation of an 8-metre by 2.5-metre long ad at the front of the Cathay Cineleisure. In a conversation with Marketing, a Cathay spokesperson clarified that new ad was up last Wednesday, one day prior to receiving the email from ASAS. “As mentioned, as Cathay is the ad platform provider, we have forwarded ASAS’s request to the Pink Dot organisers and will leave them with the final decision on the removal of the statement. Thank you,” the Cathay spokesperson added. 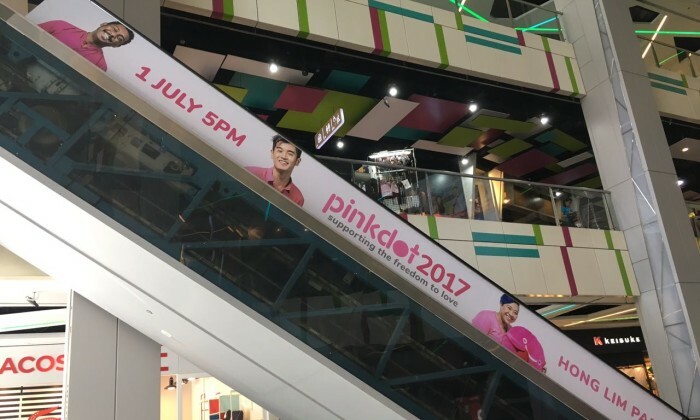 According to Pink Dot organisers, the advertisement put up at the front entrance had been planned all along. It explained that the first ad was placed on the mall’s escalator. Meanwhile, the roll out of the second ad at the entrance was a scheduled event and proceeded as planned. It occurred after calls were made to report the first ad to the police and before the ASAS and Cathay issued responses. In a conversation with Marketing, Goh Shufen, president of IAS, said that from the IAS’ perspective, it supports communication that expresses a point of view. Hence, it does not see a need to change a line that is not in breach of any law. “As a champion of talent in the marketing industry, we believe in diversity and inclusion as bedrock for creativity to flourish and prosper,” the IAS spokesperson added. Meanwhile, Cherian George, associate professor of Journalism, Hong Kong Baptist University, posted on his Facebook, that ASAS’ statement, although wrongheaded, tells people that “ASAS actually exists and has lots of time on its hands”. “If the Advertising Standards Authority can take up frivolous complaints such as this, surely it can vigorously pursue issues of advertising ethics that are far more pressing from the standpoint of consumer rights—and even from the perspective of conservatives who are genuinely concerned about the impact of advertising on social values,” George explained. Now that people know that ASAS exists and has the time, George said that consumers can now nudge it in the right direction by familiarising themselves with its code and take full advantage of its complaints procedure. “If the good people of ASAS start taking a proper look at problematic advertising in Singapore, I think they would be the first to admit that they’d have no bandwidth to entertain the kind of complaint we’ve just witnessed,” George added. The appointment is for two years. .. The partnership is set to boost OpenHouse's position in the property portal market. ..
Bell Pottinger Asia name change: Good PR move for a distressed PR firm? "Sometimes the brand is so badly damaged that it needs a different name and structure to move forward.".. Alfred van de Pol said, “if we are serious about winning the Indonesian market we need a website the majority of Indonesians can u..